Reindeers and Spheres by Carsten Höller, now on view at the Gagosian Gallery in Los Angeles, presents an intriguing mix of photographic collages, sculpture, and installation that provoke the structure of learned behavior in order to question what is considered rational. “The real material I am working with is people’s experiences”, the artist said of his work. There is no cohesive underlying meaning; everything is left to the interpretation of the viewer. The exhibition is Höller’s first show in Los Angeles. 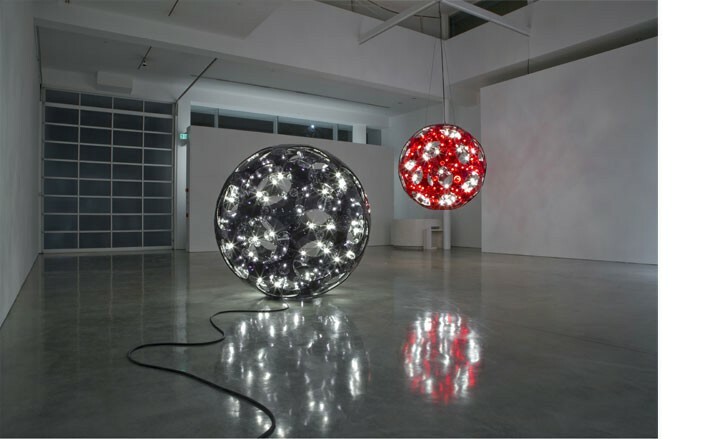 Black Double Sphere (2008) and Red Double Sphere Hanging (2008) flash on and off at different intervals. The Soma Series I-5 (2008) captures a series of photographs displayed in collage; some are focus and others are not and show a reindeer and a naked woman with long blond hair that recalls Botticelli’s Birth of Venus. 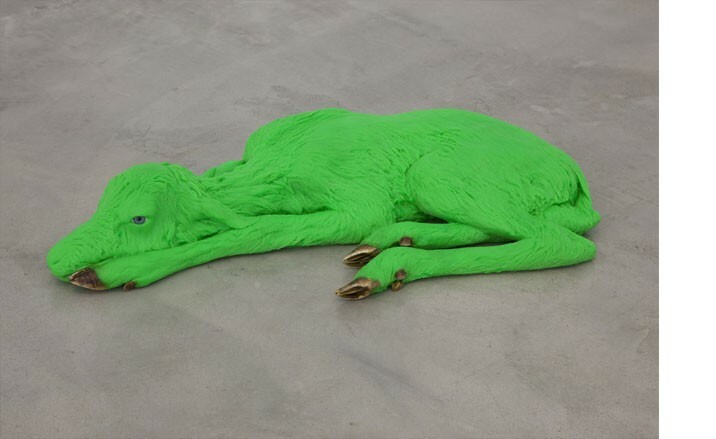 A fluorescent green cast of a baby reindeer (2008) lies meekly curled up on the ground and has bright green glassy eyes. Carsten Höller has a doctorate in biology and uses his training as a scientist in his artwork. He concentrates particularly on the nature of human relationships especially on human perception and self-exploration. His sculptures invite the viewer to participate as a way for him to examine his theories relating to physiological reactions and human emotions. Born in Brussels in 1961, Carsten Höller has shown internationally over the last two decades including solo exhibits at the Fondazione Prada in Milan (2000), the ICA Boston (2003), Musée d’Art Contemporain, Marseille (2000), MASS MoCA (2006), and Kunsthaus Bregenz, Austria (2008). In 2006, he conceived “Test Site” for The Unilever Series at Tate Modern, London, and represented Sweden (with Miriam Backström) at the 51st Biennale di Venezia. Höller has most recently opened the bi-cultural restaurant/ nightclub called The Double Club in London in collaboration with Fondazione Prada for six-month period. Located in an old Victorian warehouse next to the Angel tube station, The Double Club consists of three spaces: a bar, restaurant, and dance club. The space creates a unique dialogue between Congolese and Western contemporary music and design and facilitates cross-cultural coexistence. Höller lives and works in Stockholm, Sweden. This entry was posted on Tuesday, January 13th, 2009 at 4:43 pm	and is filed under Go See. You can follow any responses to this entry through the RSS 2.0 feed. You can leave a response, or trackback from your own site.